Few days ago when we went for grocery shopping, Kay grabbed a small pack of beef steak. We don't buy meat often so I was curious what he was planning. He started to make chang chorim. It's one of the typical Korean side dishes. Basically, boil beef (lean meat) and add soy sauce and spices such as garlic and chili after a while. Simmer until the meat is seasoned well. This time Kay added few boiled eggs. Very yummy with a bowl of rice. 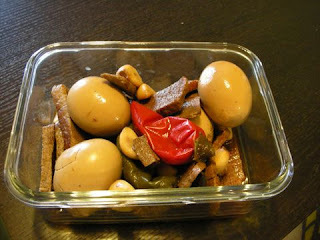 Ines gave some homemade umeboshi (Japanese pickled plum). Super salty and sour, though very addictive. I like most kind of pickles. Have to try another varieties soon. That looks good, especially the homemade (!) umeboshi. 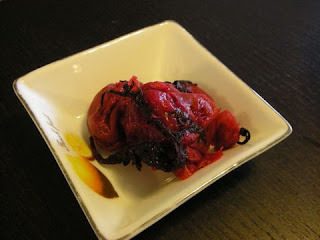 I love umeboshi - they are my favorite! I also like the ume shiso roll in some Japanese restaurants--they have these at Fuji and the Japanese place near Insadong. So good! Calico: I didn't know you liked umeboshi! :D Do you eat natto too?